It’s sometimes said that the Democratic Party is less comfortable with religion than the GOP. And it is true that, on the whole, Democrats are less religious than Republicans. But this glosses over profound racial and ethnic differences within the Democratic Party: While white Democrats are less likely to be religious than Republicans, nonwhite Democrats – who mostly identify as black or Hispanic – more closely resemble Republicans overall on a host of religious measures. For example, among Democrats and those who lean toward the Democratic Party, 95% of all nonwhites (which includes 99% of blacks) say they believe in God or a higher power, according to a recent Pew Research Center survey. This is exactly the same level of belief seen among Republicans and Republican leaners. By contrast, 78% of white Democrats believe in God or a higher power. 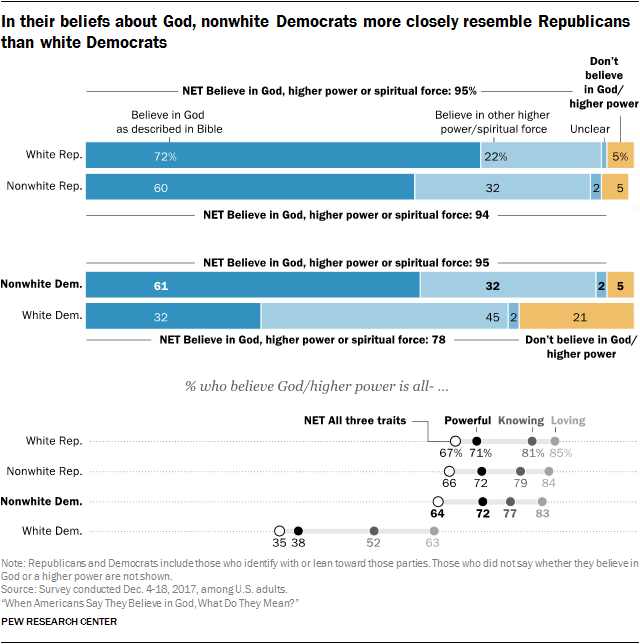 And the share of white Democrats who say they do not believe in God or any higher power (21%) is quadruple the level seen among nonwhite Democrats (5%), as well as among both white and nonwhite Republicans (5% each). There is a similar pattern when it comes to belief in God as described in the Bible. Nonwhite Democrats are roughly twice as likely as white Democrats to say they believe in the biblical God (61% vs. 32%), and are only a little less likely than Republicans (70%) to say this. In addition, nonwhite Democrats are almost twice as likely as white Democrats to say they believe that God or another higher power is all-knowing, all-loving and all-powerful (64% vs. 35%). Among all Republicans, 67% say they believe this. These findings are consistent with data on other measures of religious commitment. For example, according to the 2014 Religious Landscape Study, 39% of nonwhite Democrats say they attend church weekly or more, a level nearly as high as that of Republicans overall (44%) and nearly twice the level seen among white Democrats (22%). 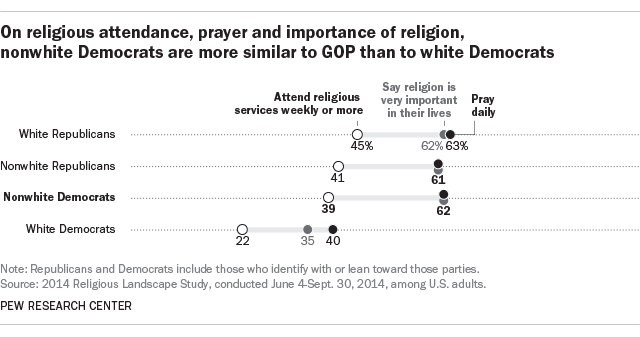 And the 62% of nonwhite Democrats who say they pray daily is identical to the share of Republicans who say this; among white Democrats, 40% pray daily. In addition, while nearly identical shares of Republicans and nonwhite Democrats say religion is “very important” to them (61% and 62%, respectively), only 35% of white Democrats say this. Looking only at black Democrats, this group is at least as religiously committed as Republicans overall, if not more so. Nearly half (47%) of black Democrats say they attend church at least weekly, and about three-quarters pray daily (74%) and say religion is very important in their lives (76%). Overall, nonwhite Democrats also are much more likely than white Democrats to describe themselves as Christians (72% vs. 57%), although by this measure they are not exactly like Republicans, 82% of whom identify as Christian. Similarly, nonwhite Democrats fall in between Republicans and white Democrats on views toward abortion: 58% of nonwhite Democrats (including 57% of black Democrats) say abortion should be legal in all or most cases – larger than the share of Republicans who say this (38%) but smaller than the share of white Democrats (76%). There also are other ways in which Republicans and nonwhite Democrats do not resemble one another in their religious characteristics. For example, in a 2014 survey, Christian Democrats – including both whites and nonwhites – were considerably more likely than Christian Republicans to say that “working to protect the environment” and “buying products from companies that pay their employees a fair wage” are “essential” to what it means to be Christian.